ĐIỆN BIÊN — Management of the Mường Phăng forest in the northern mountain province of Điện Biên had faced a number of difficulties, said Nguyễn Việt Cường, director of the Mường Phăng Forest and Environment Management Board. The forest has a total area of more than 4,400ha, covering Pá Khoang and Mường Phăng communes in Điện Biên District, according to Prime Minister Nguyễn Tấn Dũng’s Decision 1976/QĐ-TTg issued on October 30, 2014. The Mường Phăng Forest and Environment Management Board manages more than 1,000ha based on Decision 611/QĐ-UBND issued by the Điện Biên Province People’s Committee on July 24, 2015. The management board, Cường said, had only eight workers so inspections were not performed regularly. Additionally, the forest is close to the homes of residents in 47 villages, most of whom are Thái ethnic minorities. The management board set up a community system to protect the forest, however the system did not prevent further destruction as the families did not want to stop their neighbours. The management board has highlighted various hot spots where local residents were taking wood for fires or to build houses. Most of them are in Dông Mệt, Vang and Co Cượm villages. Residents from the villages use rafts to transport the wood across Pá Khoang Lake. Since the beginning of this year, the management board discovered three cases of illegal deforestation and two cases of destroying the forest, across total areas of more than 8,300sq.m. 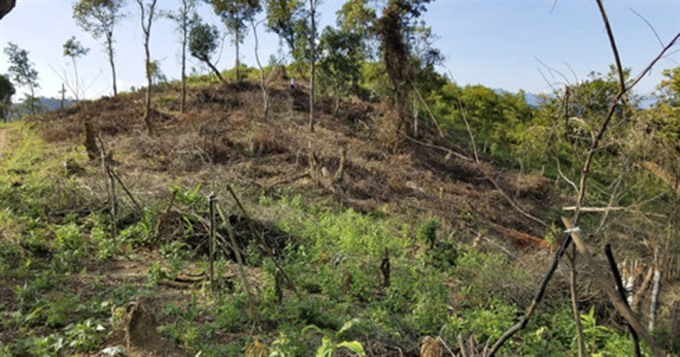 Phạm Văn Khiên, deputy director of the Điện Biên Forest Management Department, said that the forest area was more than 4,400ha but the department had only three workers to look after it. It is regulated that it should have one worker to management every 500ha, thus the department was seriously lacking forest rangers. In the future, the department will collaborate with local authorities to provide more education on forestry protection and legal requirements to local residents. They would also put in place supportive policies for local residents to prevent them from destroying the forest to earn a living.